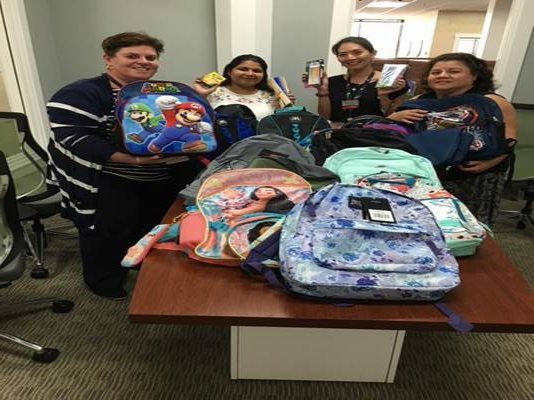 WALTHAM, MA (September 6, 2018) — Last week, the RTN Federal Credit Union Employees Community Outreach Committee donated fifteen fully stuffed backpacks for students and a large box of school supplies for teachers in Waltham Public Schools. The Backpack Drive is one of the activities the Committee holds during the year to support non-profit organizations and charities in local communities through personal donations and contributions of their free time. The backpacks and supplies were collected at RTN branches, and distributed to the Waltham Public School system through Waltham Crossings, an assisted living facility in Waltham that organized a backpack project this summer. There are more than 120 homeless families in Waltham with school-age children, and the goal was to send as many of those children as possible off to school with brand new backpacks and supplies to start the school year off successfully. RTN is a member-owned, not-for-profit financial cooperative committed to helping members achieve financial well-being through quality products and personalized service. Founded in 1945, RTN is one of the ten largest credit unions in Massachusetts, with nearly $900 million in assets, nearly 50,000 members and 20 branches. RTN Federal Credit Union serves more than 800 employer groups including two major employers in Massachusetts - Raytheon Company and Brigham and Women’s Hospital.